Have you ever wondered how to segment your customers? Customer segmentation is a really useful technique to group similar customers together and understand what works for that. You can then tailor your offering and marketing messages to the specific segments. If you do it right, you should be able to see a healthy increase in sales. After all, companies like Amazon target their customers on an individual level so you should at least be targeting them on a segment level. Clustering is an exploration technique for datasets where relationships between different observations may be too hard to spot with the eye. So you use mathematical equations to surface those relationships. Some mathematics is involved but is hidden behind the code. You can use R’s in-built help features to understand the mathematics further or refer to resources mentioned at the bottom. So let’s take a supermarket shopping dataset available at BigML.com. You’d need to create an account on the site to get this dataset free of cost. Sure, this dataset would differ from your ecommerce dataset but the concepts and the approach would be the same. Download the dataset from BigML by clicking on the cloud button and then clicking on “Request Export (CSV)”. After some background processing, the “Request Export (CSV)” option will change to “Download Dataset (CSV)”. Save the dataset in csv format in the directory output by this function. After you’ve downloaded the dataset and opened it in any spreadsheet application, you will be able to see 40 fields. Study the fields and make sure you are able to understand what they mean. Since the dataset has over 60,000 rows, and my main objective is just to show you the process of clustering, let’s take the top 3000 observations and save that as a csv file in the same directory as “small_customer.csv”. When you begin any kind of data analysis you should, as much as possible, start with a hypothesis and then perform analysis to test your hypothesis. My hypothesis is that customers can be grouped (clustered) according to where they shop the most. My null hypothesis (which I am trying to disprove) is that there are no groups(clusters) of customers based on where they shop. You can come up with your own hypotheses and perform clustering on the required fields accordingly. Go ahead and fire-up R-Studio if you have not already. # to remove all rows with empty values otherwise this could cause errors. # customer.clusters.amount_purchased. We will split into 5 clusters. 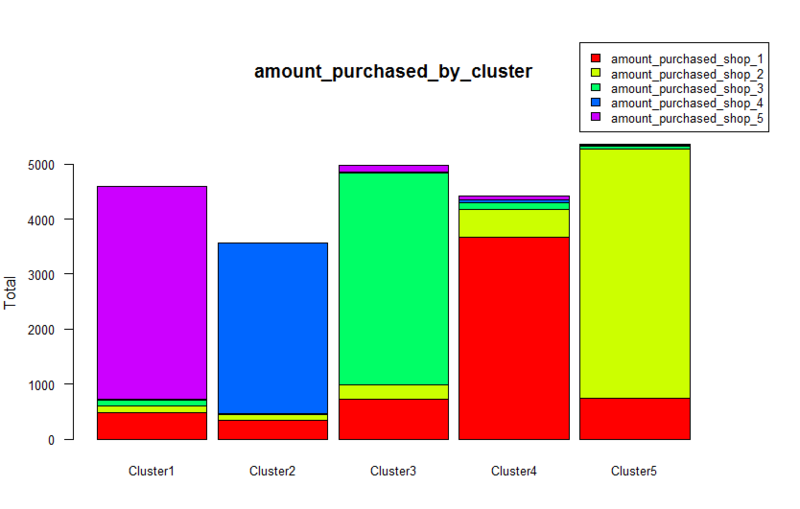 On plotting a histogram of the each cluster’s mean of amounts purchased from each of the 5 shops, it is clear that there do exist clusters of shoppers based on which shop they shop the most. You can now use this kind insights to better focus your marketing efforts for each store to the right customers. In this specific case for example, if there is a competing store in the neighbourhood of Shop 3, you can send marketing material/discount coupons to only those customers who shop at Shop 3 and keep them from going to the competitor’s store. You would do this without wasting marketing dollars on sending coupons for Shop 3 to customers who usually shop at Shop 5. You could further use this data to understand shopping habits and estimate sales at planned new stores at different locations. Try clustering the dataset in more ways and share in comments below if you find clusters based on other fields! Feel free to leave comments if you have any questions. Supermarket Data aggregated by Customer and info from shops pivoted to new columns. @Rustam: Originally I had planned to write about both methods in the same post but it became too long. So, I decided to keep PCA as a follow up post. You are right, it is a little confusing that I left PCA there. @Michael Muller: Thanks for your constructive suggestion. Indeed the post can be better if I add more explanation along the lines of your suggestion. I am considering doing a follow-up post to address that! Thank you. I appreciate the clarity of the steps. However, I suggest that you add a bit more information about options in clustering. I believe you have chosen k-means clustering, but of course there are other clustering algorithms. Some of your readers will want to know about alternatives (and their strengths and weaknesses), and may want to be able to compare the outcomes of different clustering approaches. Also, you've chosen to use (specify) 5 clusters. By coincidence (??) there are also five variables. I think your readers will benefit from a discussion of how to choose the number of clusters (as is required for k-means), and what they should do to explore different numbers of clusters. To be clear: I think this is a very good post. I'm only suggesting ways to move from very good to excellent. Why did you notice PCA if you don't use it? 1. Try incognito mode for downloading. 2. If you don't mind the inconvenience, create a new account while trying to download it. If you have a premium account already, they may try to charge you even for datasets they offer you for free.